Topsi pendant by German design duo Hüttners (Mirjam Hüttner & Claude Müller). Anodised aluminium in 16 different colours. Happy New Year, friends of Moberg Fung! Modernatique / rounge chair by Korean designer Hyung Suk Cho (Cho hyung suk Design). Modernatique chair has elements of antique style (beautiful curves) and modern design (clean lines). 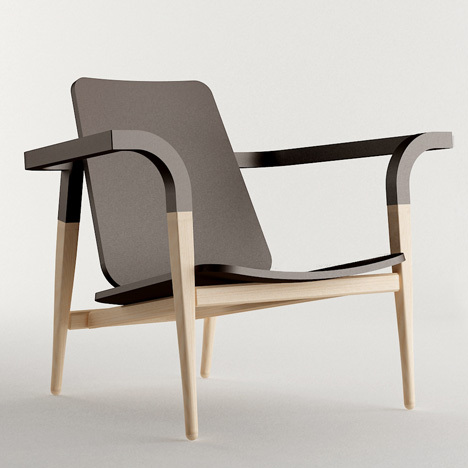 MA23 Chair by Finnish design house & studio Jaanisays (by Jaani Vaahtera). Made of birch plywood (seat, back) and solid scandinavian alder (legs). Theurel & Thomas – Maison du Macaron is the first pâtisserie in Mexico (San Pedro) specialised in French macarons. The Theurel & Thomas pâtisserie has an enlightened space with an exclusivity and elegant atmosphere and it’s… all white. Branding and interior design by Mexican company branding agency Anagrama. Linna Armchair is made made of solid wood with multilaminated shells in the seat and back. Designed by Jader Almeida from Brazilian eddas – design architectura. Silver prize winner at IDEA 2010. Angled Enamelled Shades. Circa 1950. Angled to illuminate a wall or object and supplied with new bayonet (B22) lamp holders and 2 meters of traditional twisted braided black cable. Available at Skinflint.